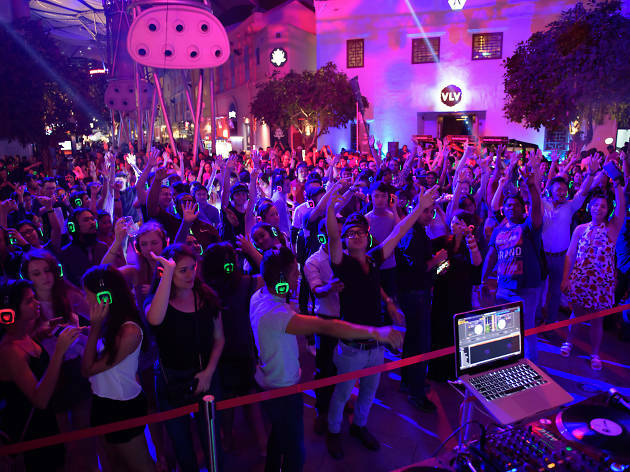 Interactive events and Silent Disco generates new leads & clients - by creating an “out-of-this-world” experience to lure in new customers, or by maximizing engagement & positive impact with an event targeted to an existing customer-base. Read more. Silent Disco Vibe is changing Yoga by merging many different art forms. Read more about how Silent Disco Vibe's "Immersive Yoga" series. Silent Disco is changing the way music festivals interact with their audience. Not only do the audience members have the ability to choose between 3 DJ's to listen to, but festivals are able to rage on late into the night because sound ordinances are no longer an issue. Read more to find out how Silent Disco is changing the face of Music Festivals around the globe.